I've been late to post about my trip to Meghalaya. 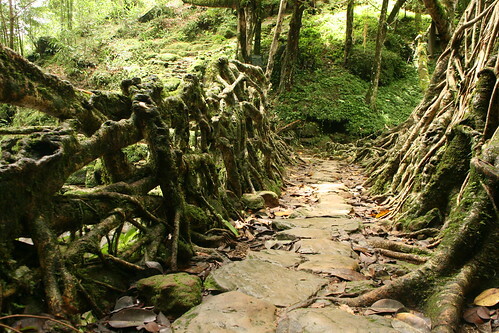 One of the most remarkable features that we encountered in the Khasi hills of this state are these living root bridges. 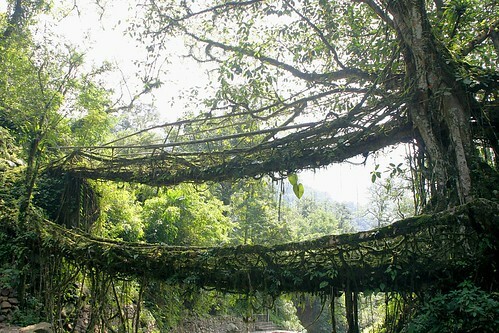 In a practice perfected by the Khasi tribe, the growth of the secondary roots of rubber trees are guided by the use of betel-nut trunks to form, over the span of decades, bridges that can be used by humans to cross streams and rivers. You've got to see them to believe that this is even possible. To me, not only was the geo-engineering aspect marvelous, but it was heartening to see a community's long-term stake in its environment. The picture above was from a bridge near Mawlynnong. Notice that they even managed to shape the hand-railings! Near Cherrapunjee, there was also this fantastic double-decker bridge. And you, Mr.Everest, are firmly entrenched in the I-pretend-they-don't-exist list. :). But you'll really enjoy the north east mate. i narrowly missed going to Chirapungi although I went to Meghalaya :( btw, Happy B'lated B'day.